Here’s what I love doing most, a kind of split issue — where two big storylines are unfolding simultaneously. Lots of action, heaps of those loose ends starting to thread together, and a whole bunch of dead (or dead-ish) Decepticons. Clearly, the Wreckers have survived the orbital missile attack that ended #81. Don’t think anyone expected otherwise. And okay, there was something of an elapsed time conceit between the final two panels of that issue, but showing them running for the escape pods would clearly have dented the drama somewhat. Anyway, strand number one is Kup and the Wreckers on Earth, in not the best of shape, against a wholly deranged Megatron and his zombie-con army. The whole idea of zombie Transformers was something I explored way back in the UK story City of Fear, and this is certainly a kind of oblique nod to that story, but also it’s yet another kind of loose end from the stories that preceded my run on the US book that I felt needed attention. Did Prime have all the Autobots left deactivated after Starscream’s Underbase rampage put in stasis and just leave the Decepticon dead lying around on Earth? It seemed unlikely, so I started to wonder if there was a whole other cryo-unit on the Ark we hadn’t seen, and if so… Well, all will be revealed… eventually. As bad as it’s already got for the Wreckers, there are several more wringers for them to go through. And even then, not all of them will make it out alive! 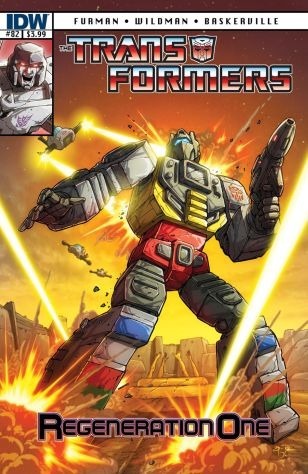 Story strand two was Grimlock, alluded to briefly in #81, who’s gone rogue in an effort to find a cure for the Nucleon in his system that has rendered him unable to transform (and maybe affected others in other ways??). All the way over in #86, we’ll see the real spur for the start of this quest, but for the moment his burning need to find a way to purge the Nucleon (or even get a whole new body) has brought him to Nebulos, a planet that loomed large on my list of things that needed closure. What happened, I wondered, to the original heads of those who became Headmasters? When their Nebulan Avatars died (in the Unicron battle), did they die as well? What were relations like between post-civil war Cybertron and Nebulos (things were decidedly frosty and unwelcoming back in #42)? All these things roll into what will become the second of our four major story arcs, but it all starts here. Oh, and Ultra Magnus’s icy cool/control finally snaps! And a bunch of other stuff too, like… what became of Ratchet? Though if you’ve seen the preview of the issue, you’ll have a pretty good idea. Transformers web resource and news site, The Allspark, has just published a quick Transformers: Regeneration One Q&A. You can view the questions (and answers) here. This coming weekend, I’m off to Germany for C.O.N.S., a Euro Transformers event with special guests Andrew Wildman, Klaus Scherwinski… and myself of course. The convention is over one day (Sunday July 22nd) and also features rock act Rampage — live on stage — who’ll no doubt be performing their Transformers inspired anthem ‘Letz Go transform’. I had a blast at last year’s C.O.N.S. (a very buzzy & friendly event with dealers, panels, cosplay, raffles and more). In fact, for this year’s event, I’ve written an exclusive voice play (to be performed by guests, organizers and attendees alike) to celebrate the 10th anniversary of Transformers: Armada. It’s called “Tall Story” and it’s a bona fide C.O.N.S. exclusive. I’ll be bringing along my usual pile of signed original scripts, comics and more — so come along and join in if you can. For more details of the event itself, check out the C.O.N.S. website here. The official Transformers facebook page has a nifty creator commentary on the first 5 pages of Regeneration One #81. You can check it out here. RG1 #81 — IS HERE! To celebrate the release of Transformers: Regeneration One #81 (the continuation/conclusion of the Transformers comic series that started it all), the creative team — myself, Andrew Wildman, Stephen Baskerville and John-Paul Bove — have all pulled a little teaser treat from our file of upcoming RG1 issues. From me, here’s a chunk of upcoming dialog from a future issue of RG1 (not telling you which), and when you’re done with that follow the links to other (visual) Easter eggs from Andrew, Stephen and J-P.
SWOOP (off): LIKE I SAID. NOT PRETTY. 2 (LINK): REASON, RESTRAINT — ALL GONE, SWEPT AWAY BY THE NUCLEON TSUNAMI ROARING THROUGH HIS INTRA-SYSTEM. 3 (LINK): HE’S REGRESSED TO SOME SAVAGE, PRIMEVAL STATE. A LOT LIKE THE MINDLESS EARTH-BEAST THE ARK MODELLED HIM ON. 4 (LINK): PLENTY OF RAW POWER… WAY MORE THAN BEFORE… BUT A HIGH PRICE TO PAY. The countdown to the release of Transformers: Regeneration One #81 this Wednesday (July 11th) continues with the return of an old blog standard — the script (w)rap (pre-release digressions on the thought processes behind the comic script). Beware, though I take pains not to give away anything critical, there are always light spoilers. Page 12: In one review of #80.5, I saw this whole end sequence described as being like the pre-credits segment of a Bond movie, and I kind of like that. That’s definitely the vibe. And there’s a satellite, which immediately makes you think of Diamonds are Forever or Die Another Day. Up till now, it’s been a lot of (necessary) re-establishment of characters and settings, laying the groundwork for Regeneration One #81, but here/now things start to kick into gear — and these next three pages of action seem a better fit as the first three pages of Regeneration One proper. This is where it begins. The action plays out at the Kalis-Baird Beaming Transmitter, another location I culled from an old UK story, City of Fear. No huge significance to this, except that the whole idea of zombie Transformers was on my mind, for reasons that will become apparent in #82. Overall, I just liked the idea of re-using actual (already established) locations, rather than creating new ones. A couple of ‘red shirts’ quickly get wasted and Soundwave’s crew are in. I took a great deal of pleasure in bringing back the Firecons as part of his squad. They’d only appeared in the UK series before and I kind of liked them. Page 13: Whatever Soundwave was going to do now, I wanted it to play to his strengths as a character. It’s unexpected. Cunning. A low value target that’s likely to have had only a skeleton security crew. And his plan involves communication, or rather supplying false communication to an unthinking bit of space hardware. And the fact that Cybetron even has asteroid-smasher satellites plays into the nature of the planet’s original rough ride through space (which led to the creation of the Ark), a scene we see played out on the second of the flashback spreads. See, most things are there for a reason. So Soundwave realigns the satellite and it prepares to fire. But on what? Or who? Pages 14-15: Our final flashback spread brings us right up to date, and is probably the most important of all, as it establishes — the corrupted Creation Matrix (yes, I know I call it the Matrix of Leadership, but leadership is a very important concept in RG1, so didn’t feel too bad adopting this alternative description), Thunderwing’s brief ownership of said corrupted Matrix, Unicron, Prime’s death, the idea that Galvatron is Megatron’s future self, the Last Autobot (there he is again, just in case you’d forgotten his appearance on page 4) and the defeat of Bludgeon on Klo. All, in their own ways, loose ends, which is coincidentally what the first story arc is called. Page 16: Then… being very careful not to cover J-P’s extra-bright ‘star’ with a Zero Space caption — Krakadoom! My favourite sound effect from the old days (say it out loud, in its three syllables). Possibly with the exception of Ba-Throom! There goes the Last Autobot. Problem solved. Everyone has to now sit up and take notice, surely. Even Prime. And playing with the whole End and Beginning thing (as on page 1), we have the beginning of the end. Which this most definitely is! You are currently browsing the simon furman blog archives for July, 2012.